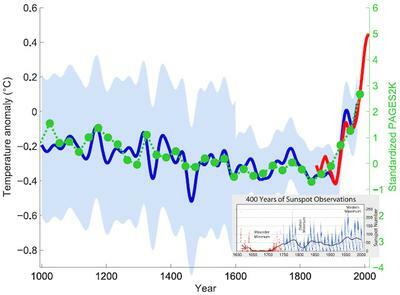 Per the PAGES 2000 reconstruction, current global surface temperatures are hotter than at ANY time in the past 1,400 years, and that while the Medieval Warm Period and Little Ice Age are clearly visible events in their reconstruction, they were not globally synchronized events. 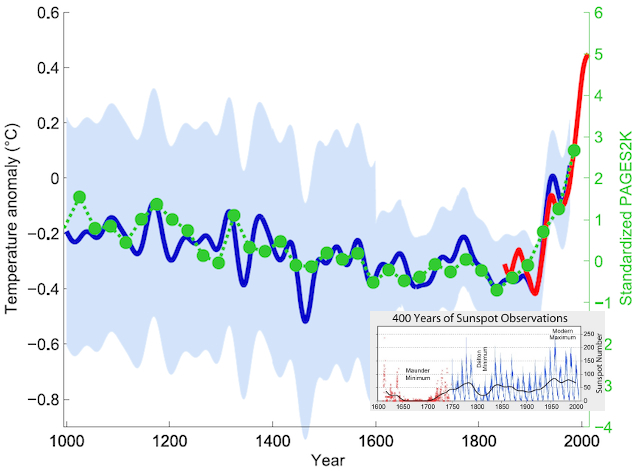 The main drivers of the Little Ice Age cooling were decreased solar activity and increased volcanic activity. These factors cannot account for the global warming observed over the past 50-100 years. Furthermore, it is physically incorrect to state that the planet is simply "recovering" from the Little Ice Age. Join in and write your own page! It's easy to do. How? Simply click here to return to Your Pages.